3 stars for this adaptation of a Charles Dickens novel. The Mystery of Edwin Drood is based on the unfinished novel by Charles Dickens (David Copperfield, Great Expectations) and is presented here with a new ending written by Gwyneth Hughes (Miss Austen Regrets, Remember Me). It is a BBC production, first shown in 2012 and now being released to DVD for the first time in the UK. The film takes place in the fictional town of Cloisterham. It opens with the choirmaster of the Cathedral, John Jasper (Matthew Rhys – Burnt, Titus), dreaming about strangling his nephew Edwin Drood (Freddie Fox – Victor Frankenstein, Pride) as Edwin’s fiancee Rosa Bud (Tamzin Merchant – Pride and Prejudice, Salem) watches on. He awakens to find himself in an opium den, his favourite hang out. 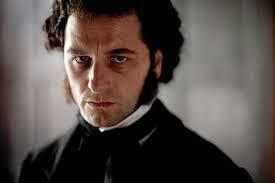 He is insanely jealous of his nephew Edwin and besotted with Rosa, who is his music pupil. Rosa, who is only seventeen, is well aware of his feelings but tries to avoid him at all costs. She is beginning to fall out of love with Edwin, who really is a spoilt brat and who doesn’t appreciate her at all. She is however no more enamoured with his creepy Uncle than with him. 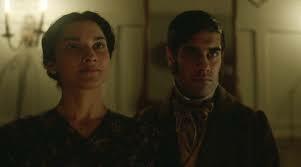 Tensions rise in Cloisterham upon the arrival of two foreigners from Ceylon, Helena Landless (Amber Rose Revah – Indian Summers, Son of God) and her brother Neville (Sacha Dhawan – The History Boys), staying at the home of Reverend Septimus Crisparkle (Rory Kinnear – Skyfall, The Imitation Game). Although they get on really well with Rosa, they clash with Edwin and when he suddenly disappears, the race is on to work out what happened to him as the finger of blame points in all directions. This is not a bad adaptation of this story and the new ending is actually quite good. It’s main problem is with pacing, by the time it got to the twist I had pretty much lost the will to live. It is also not as atmospheric as I expected. While trying to be Gothic, it ends up all being rather too arty in true BBC style. It also suffers from another common BBC problem, it was first shown in 2012, so anyone waiting for it probably gave up years ago and when it finally does come out it’s only available on DVD. If you’re into costume drama and Charles Dickens then you will probably want to add this one to your collection. 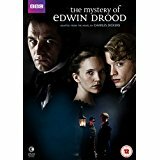 The Mystery of Edwin Drood is available to buy now on DVD.